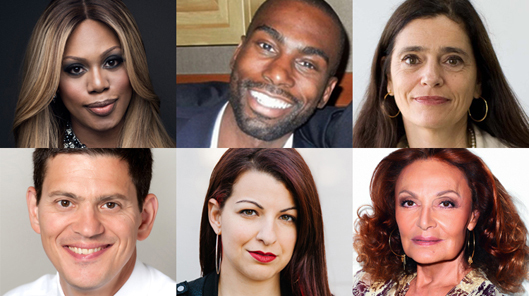 Clockwise from left: Laverne Cox, DeRay Mckesson, Mercedes Doretti, David Miliband, Anita Sarkeesian, and Diane von Furstenberg have been named honorary degree recipients by The New School. NEW YORK (March 31, 2016) – Actress Laverne Cox, fashion designer Diane von Furstenberg, and Black Lives Matter activist DeRay Mckesson are among the honorary degree recipients who will speak at The New School’s 80th commencement exercises on Friday, May 20, at 11 a.m. at the Jacob K. Javits Convention Center, 655 West 34th Street, New York City. President David E. Van Zandt will preside over the ceremony. Media critic Anita Sarkeesian, International Rescue Committee president and CEO David Miliband, and forensic anthropologist Mercedes Doretti round out the illustrious group of speakers/honorary degree recipients. Dispensing with the formalities and cliché speeches, the honorary degree recipients will take turns delivering brief, impactful, five-minute talks that will get to the heart of their advice to The New School's graduating class. The event will be broadcast live on Livestream. Laverne Cox is an Emmy-nominated actress and Emmy-winning producer best known for her role as the transgender inmate Sophia Burset in the critically acclaimed Netflix series Orange Is the New Black. She is the first trans woman of color to have a leading role on a mainstream scripted television show and the first trans woman of color to produce and star in her own television show, VH1’s TRANSForm Me. Diane von Furstenberg is a world-renowned fashion designer. She has received the Council of Fashion Designers of America (CFDA) Lifetime Achievement Award and was named one of TIME magazine’s 100 Most Influential People for 2015. She is the director of The Diller – von Furstenberg Family Foundation, a philanthropic organization that supports efforts such as community building, education, human rights, arts, health, and the environment. DeRay Mckesson is an organizer, educator, and activist in the Black Lives Matter movement focusing on innovation, equality, and justice. Born and raised in Baltimore, he has been active around issues related to children, youth, and families for more than 15 years. Mckesson’s civil rights work has had national impact, leading Fortune magazine to name him one of the World’s 50 Greatest Leaders in 2015. This year, he announced his candidacy for the mayor of Baltimore. Anita Sarkeesian is a media critic and the creator of Feminist Frequency, a video web series that explores the representation of women in pop culture narratives. Her work focuses on deconstructing the stereotypes and tropes associated with women in popular culture and highlights the targeted harassment of women in online and gaming spaces. David Miliband is the president and CEO of the International Rescue Committee. Founded by Albert Einstein in 1933, the IRC is committed to providing aid to those affected by humanitarian crises around the world. Miliband has had a distinguished political career in the United Kingdom, where he served as minister for Schools from 2002 to 2004 and head of Downing Street’s Number 10 Policy Unit from 1997 to 2001. From 2007 to 2010, he served as the UK’s foreign secretary, the youngest in three decades, promoting human rights and representing the United Kingdom around the world. Mercedes Doretti is a forensic anthropologist who unearths evidence of crimes against humanity. Her work is aimed at restoring voices to long-silenced victims and presenting critical findings to tribunals, human rights organizations, and special commissions around the globe. The New School’s Class of 2016 is made up of 3,216 associate’s, bachelor’s, master’s, and doctoral graduates in art and design, the social sciences, the humanities, management, and the performing arts. This is the first graduating class of several new academic programs, including the BA in Anthropology, MS in Data Visualization, and BS in Media Studies.